If you're a fan of New York football, you have a very important question to ask yourself: Are you a Jets fan or a Giants fan? If you said Jets, then take a hike! 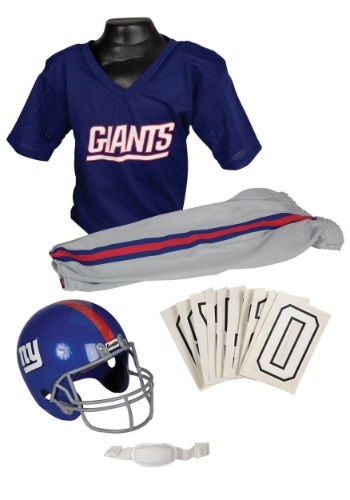 But, if you are a true blue Giants fan, then this officially licensed NFL Giants Uniform Costume is the perfect thing to wear while watching your favorite team storm the gridiron! As one of the oldest pro football teams in the NFL, it's pretty safe to say the NY Giants have quite a bit of history and tradition backing them up. But, obviously your team can't keep going around with a name like "Giants" unless they put up some big wins. And who could forget the fierce rivalries they have with other teams like the Cowboys, the Eagles from Philly (one of the best rivalries to date! ), and of course, the previously mentioned Jets, which is a pretty strange one since they both share the same home stadium. Hey, sometimes you gotta get along, even if you don't like the other guy. It's the New York way! This awesome costume is easily the best way to show you're a Giant's fan! It includes a mesh jersey, and pants with matching blue, gray, and red detailing, just like the uniforms the players wear. Throw on the matching blue and red helmet, and get ready to cheer 'em on in style!